This is by no means the only way to organize the paperwork for a Girl Scout troop! It’s just the way I do it. Apparently some people think I’m good at it, because I’ve been asked to give a presentation on the subject at an upcoming leaders’ workshop. I hope this system is helpful to other leaders–try it out and adapt it to make it your own! UPDATE: Six years after publishing this article and five years after ending (pausing?) my stint as a troop leader, I responded to Kim’s request (in the comments) by cleaning out my file cabinet and posting a few photos of specific forms. Sorry I don’t have anything like complete visual documentation, but I hope the photos add some useful guidance! The most important thing I’ve learned about organizing my records on individual girls is that putting the girls in alphabetical order by first name makes a lot of sense. I think of them by their first names, not last names, and in my troop many girls have a parent whose last name is different from theirs, so last names are confusing. Alphabetical by first name is the order I use for girls’ individual forms in each section of my binder, for girls’ names on the attendance and dues sheets, for permission slips when I’m checking to see whose have been signed and returned, and for all lists where I’m marking off who’s earned a badge, paid a fee, confirmed whether she’s coming to camp, etc. I memorize the list of names (by putting it someplace where I see it several times a day) so that it’s easy for me to figure out who’s missing when I’m counting heads. any other signs I’m going to hang up during the meeting, for example, “Juniors are meeting downstairs in the gym today.” or “Don’t leave without your permission slip!”–if I’ve had time to make these signs before arriving at the church! any documents I’m planning to show the girls–for example, at the first meeting of the year, I’ll show them last year’s troop financial report, which I compiled during the summer. During a meeting, I stick into the front pocket any paperwork received from girls. (However, when I’m expecting a large volume of paperwork, I bring a separate envelope to stuff it into.) Between meetings, I file this paperwork, check off having received it, and enter data into my computer if necessary. I also put into the front pocket any decisions made at the meeting, such as menus for camp, a patrol’s notes on craft supplies they think the troop should have, or the results of voting on which field trips we want to take. In the binder rings, in front of the first divider, I keep several sheets of scrap paper. On the first one, I make a sloppy chart (just for my own reference) of who did which kaper each week. On the next one, I keep a list of who’s in which patrol, just in case anybody forgets. The rest of the sheets are for miscellaneous notes: Who’s coming to which event? Who asked me to get troop numerals for her next time I go to the Girl Scout Shop? What’s Jasmine’s new phone number? and so on. I added the note about including parents because last year, many parents thought I meant, “Who other than yourself is allowed to pick her up?” so I had to transcribe the parents’ information from other forms onto this one. I added the part about leaving by herself because some families wanted their girls to come out to the parking lot, walk over to the library to meet their parents, or just walk home on their own, rather than require an adult to come in and claim them. That’s reasonable for nine-year-old kids, but just to be safe I want to make sure of which girls are allowed to do it. (In an older troop, if some of the girls can drive, you might want to add a separate line for parents to approve their girl getting a ride home with a friend.) I added the part about non-contact in case of custody problems and such, although that’s never happened in my troop before. These are the official council forms on which parents provide the girl’s health history, doctor’s and dentist’s contact information, and the person authorized to make medical decisions if parents can’t be reached. I punched holes in two 7″x10″ envelopes. The one labeled “To Be Deposited” is for checks destined for the troop’s account; this keeps me from misplacing them or accidentally depositing them in my personal account. The other envelope is for receipts. I write all cash transactions in here as soon as possible, before I can forget them! Then I simply put cash received into my wallet. If someone else spends her own money on things for the troop, when I reimburse her with a troop check then I write the date in the Reimbursed column. Every so often, I add up all of my spending from the top half of the page, add up all the cash I received from the bottom half of the page, and calculate the difference. If cash spent is more than cash received, I write a troop check to reimburse myself. If cash received is more than cash spent, I write a check on my personal account and deposit it in the troop’s account. I note this in both the Reimbursed and Deposited columns. Usually I balance the cash only a few times a year, whenever the paper fills up and I’m ready to start a new one. Sometimes I’ll do it when the troop is low on money and I suspect I owe some, or when I’ve spent an unusually large amount (for example, if I ordered craft supplies and had to pay with a credit card) and want to get that money back. If your personal budget is pretty tight, you may want to balance the cash more often so that you don’t find you owe the troop more money than you have available. Next is the Dues Record (official council form) showing who paid her dues for each meeting. Our dues are $1 per regular troop meeting attended (no dues for special activities; no dues owed for a meeting you missed) and the girls vary widely in their ability to remember to bring it. Many of them forget for a few weeks in a row and then bring several dollars at once. 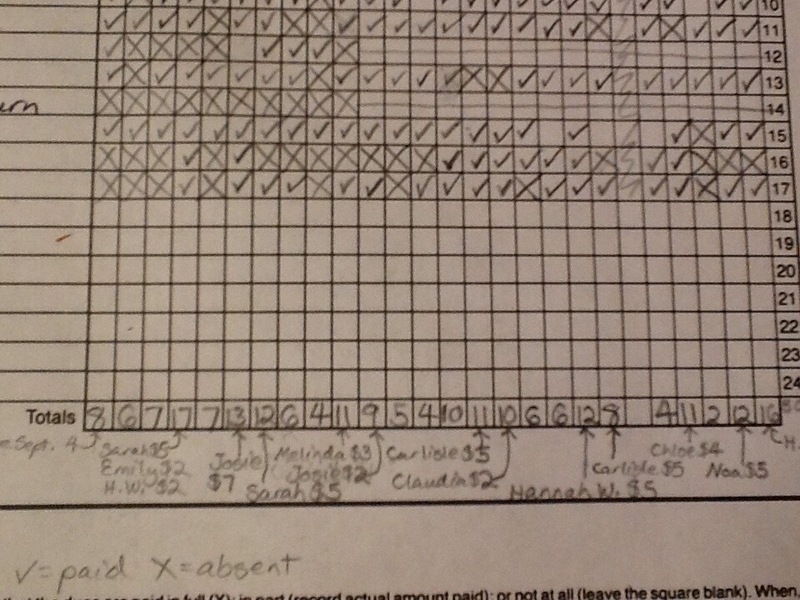 I check off one meeting’s box for each dollar paid and mark an X in the box if a girl is absent. At the bottom of the column for the meeting, I write the total dues actually received, and if anybody brought more than $1 I note her name and the amount with an arrow pointing to the total for the meeting when it was collected. Dues are cash received, above. I hole-punch the troop’s bank statements and put them in this section of the binder, just in case I or anyone else want to refer to them. These are the official council forms listing a girl’s registration history and accomplishments. Although it’s tedious completing them by hand, I find it worthwhile because they’re so useful as a reference! 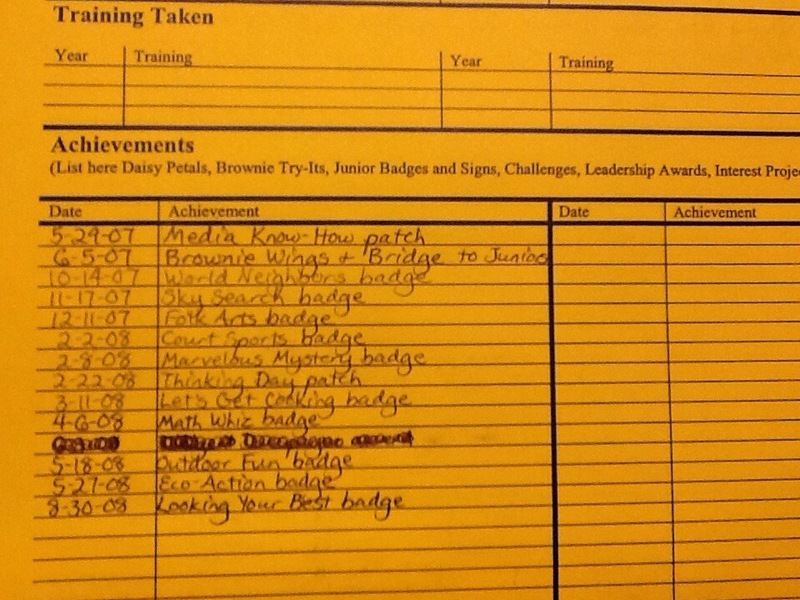 When we finish earning a badge or patch, I write it on the record of every girl who earned it. Then, when we’re planning our next Court of Awards, I look at the records to make a list of what each girl earned. Actually, the only thing I’ve ever kept in here is the community directory–the contact information for leaders and other volunteers in our region of the city. The council offers training for leaders and parent helpers to learn the skills we need to take girls to camp, build fires, sell cookies, teach archery, etc. I like to have the schedule handy in case a parent volunteers to take charge of some activity that requires training–let’s set the date right away, before he forgets! !–or I realize I need to take a new training myself. Also in this section is most of the sheaf of forms the council sends me each fall in the start-up packet. Some of these I’ve never used, but you never know when they might be needed! This is where I keep things I may want to use at a meeting but have no immediate plans for. This includes a list of “fill-in activities” in case we find ourselves with time to kill; most of them are things I noticed in the badge book that could be done on short notice with minimal equipment. I also carry around the current Girl Scout Catalog in case anybody wants to see it. The papers on which I wrote what to say in opening and closing flag ceremonies live in this pocket so that I don’t have to write it out every time we have a flag ceremony! basic information on all current troop members: full name, birth date, school, address, phone number, parents’ and emergency contacts’ phone numbers and e-mail addresses. I keep this in a text file, with no fancy formatting, because I’ve found that easiest to print or paste into e-mail when sharing the information with co-leaders or parents driving carpools. I just put a row of asterisks after each girl. forms and handouts I’ve made myself. This includes two versions of a “Welcome to Troop 15!” handout, one for girls and one for parents, explaining all the basic information about our troop. e-mails that I expect to refer back to in the long run. E-mails about short-term issues just stay in a folder of my Webmail inbox, where I can access them from work as well as home. I’ve dedicated roughly half of the top shelf of my dining room closet (which is next to my computer) to Girl Scout stuff. You might use a drawer or a box or a desktop bin, but you’ll want to have some space dedicated to storing Girl Scout things that you don’t want to carry to and from every meeting. Some of the things that live on this shelf are blank registration forms (the carbonless-copy ones mentioned above), a spare volunteer registration packet if I have one, permission slips when not in use (see below), any badges or patches or pins we have acquired but not yet distributed to the girls, our extra checks, the packet of information about our bank account, and a uniform vest I’m going to sell to somebody someday (I accidentally bought too many). The council offers two options for permission slips: one that covers just one event, and one that lists up to 10 events with numbered lines for parents to sign. 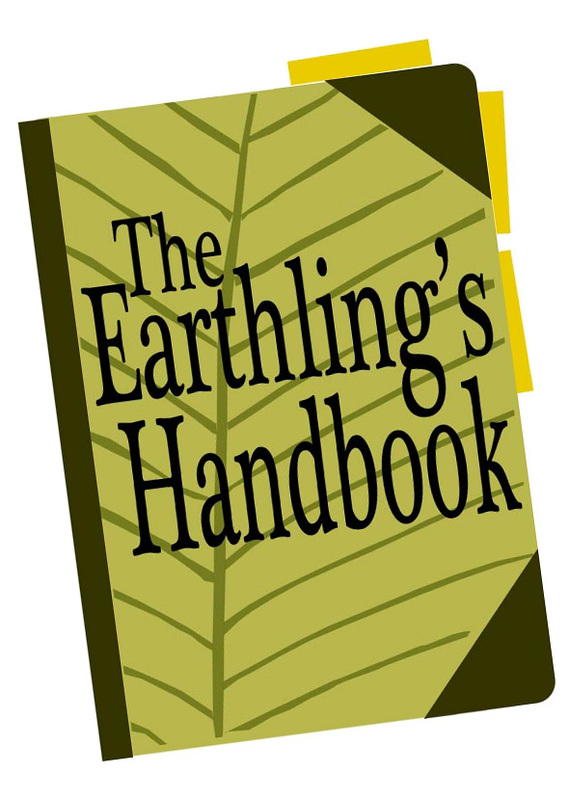 I use the multi-event version because it requires less paper, it simplifies the process when we’re doing several special activities in a short time and need to get permission for each of them, and its durable nature encourages girls to take responsibility for bringing it home and back several times. (We used the multi-event slip when I was a girl, and my leaders conveyed the sense that it was a sacred, crucial thing. I try to do this too. After all, photocopying costs troop funds, and misplaced forms are really annoying for everyone!) I print permission slips on light green cardstock to prevent them from getting crumpled and make them easy for girls to spot in their backpacks. I keep permission slips in a clearly labeled manila envelope. When we don’t need them, this envelope stays home in the closet (see above). When I plan to hand out, collect, or attend an activity that requires permission slips, I put the envelope into my Girl Scout tote bag, next to my binder. “Curriculum Ideas” holds meeting schedules, patrol assignments, or whatever paperwork I have related to activities that went particularly well. These help me to repeat the activities a few years later with different girls. I’m also posting some of the ideas on this site. “Girl Scouts” is a catch-all folder for things like directions to camps and words to songs. I hope this article helps you to organize your troop’s information, even if you’re in a different council or the specific details here have become outdated! If you have any other great tips for troop organization, please share them in the comments. ← What Do You Reuse? I found your site via WFMW and came across your Girl Scout articles. I became a Daisy Leader last year when my daughter entered kindergarten. I’ve never been able to get it all together until I read your article. It’s making a difference already, just after a few days, and I know it’s going to be a great help to me in the future. I’m sorry; I stopped being a leader in 2010 and don’t have my binder anymore. I do have some of the pages that were in it. I will try to upload some photos later tonight. So glad that I found this information. 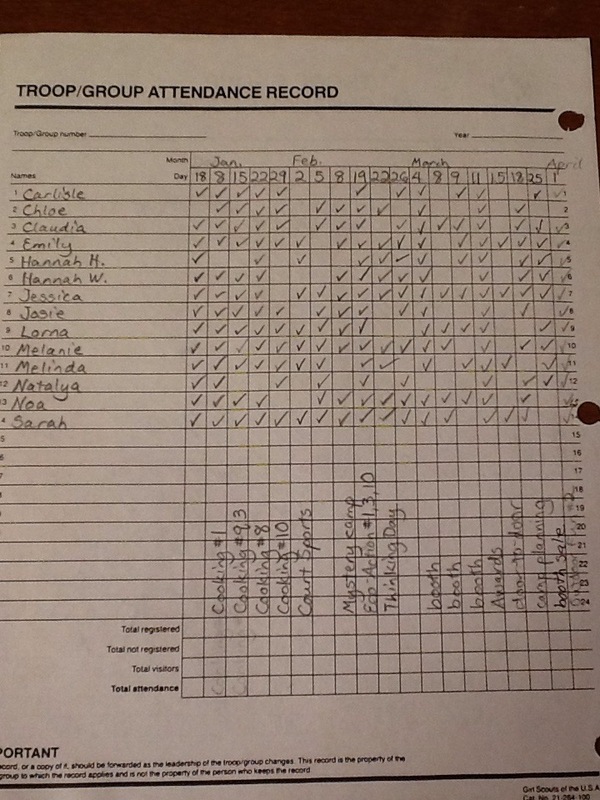 I have been looking for a long time for some info on binder organization for Girl Scouts. 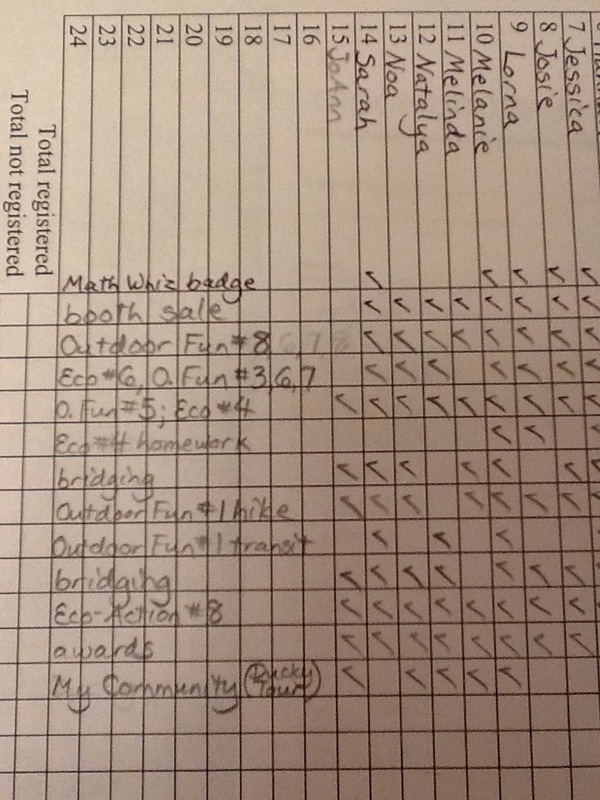 I have been a Girl Scout leader for years and am always looking for ways to improve the way all the paperwork is organized. Thanks!! !